The 69-year-old actress entertained fans who caught her sitting beside her husband of 19 years, Queen rocker Brian May, who attended in support of Bohemian Rhapsody. The Freddie Mercury biopic picked up four gongs, including best actor for Rami Malek’s turn as the late singer. And Dobson beamed as the cameras panned to her and May, who was a creative consultant on the film. Fans were quick to note how glamorous she looked. Anita Dobson is the cutest member of the audience tonight. She is so excited for every winner. Others were pleasantly surprised to see her so far from the fictional borough of Walford in east London. Anita Dobson is at the Oscars! This year can finish now, nothing is going to top that! The TV veteran played alcoholic Angie Watts – landlady of the Queen Vic pub – between 1985 and 1988. Alongside her on-screen husband, “Dirty” Den Watts (Leslie Grantham), she became a fan favourite. Some British viewers wondered if any Americans would spot the famous face in the crowd. 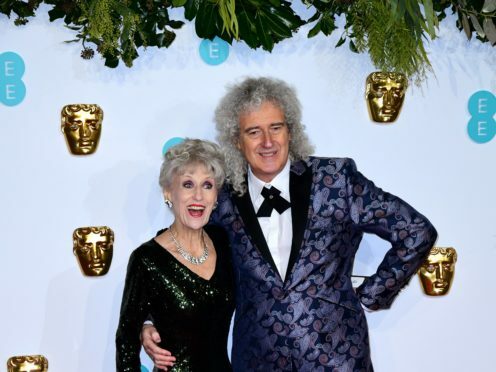 Is anyone else super psyched to see Anita Dobson finally at the #Oscars #Oscars2019 ? Others joked that Dobson’s 1986 number four single Anyone Can Fall In Love would have been a more apt introduction to the Oscars than Lady Gaga and Bradley Cooper’s rendition of Shallow from A Star Is Born. Fellow EastEnders star Ben Hardy, who left the show in 2015 after a two-year stint playing Peter Beale, was also in attendance. The 28-year-old played Queen drummer Roger Taylor in the film.